Byte Rot: Pro ASP.NET Web API is out! 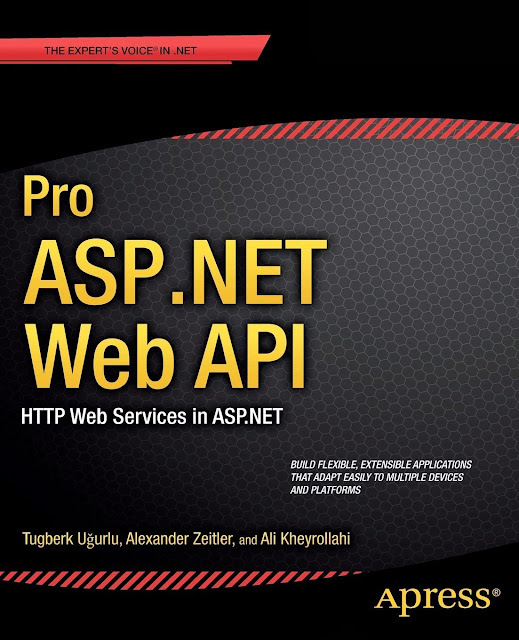 Pro ASP.NET Web API is out! Some of you who have been reading this humble blog have probably noticed that I have been pretty inactive. While this is true, I have been very busy as one of the authors of the Pro ASP.NET Web API book. I am pleased - much to my relief and equal joy - to announce that it is finally out! The process has been a long one and since I joined later in the process, it was hectic at times as I had to manage to keep up with our tight deadline. I am very grateful for my co-authors Tugberk Ugurlu and Alexander Zeitler, and wonderful people at Apress (Gwenan Spearing, Chris Nelson, Anamika Panchoo ...) who made this possible. All I can say from my part is that we have cooked the book with the same taste we would have liked to taste any other technical book: practical with real-life examples yet having geeky depth. And above all providing all-round conceptual picture which is hard to grasp by scraping through rims and rims of documentation or various blog posts alone. The book covers why as well as what and we have tried to be read like a book (and not a technical documentation): we have story to tell. Enough talking. Please provide us with feedbacks positive (or negative) as we would like to hear from your side of story. And if you can, please post a review on Amazon. Happy reading!